Our unique local climate creates perfect growing conditions for superior oats. Superior Irish oats. Naturally creamy. Just as nature intended. Microwave in 2 minutes.A bowl of Flahavan's is all about Superior Taste Creating that unique, naturally creamy taste starts with using specially selected oat varieties, such as Barra and Husky, which are perfectly suited to the mild, damp climate in the South East of Ireland where we've been sourcing our oats from local family farms for generations. 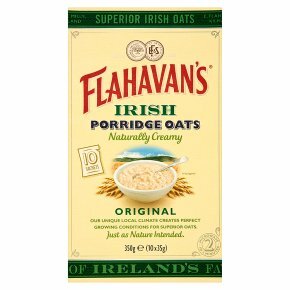 Our unique, time-proven milling methods gently retain flavour, giving our oats their rich texture, toasted aroma and distinctive naturally creamy Flahavan'staste. Just as Nature Intended. Step 1 Empty sachet contents into a microwaveable bowl 3 inches/75mm high.Step 2 Fill the empty sachet to the fill line with milk or water (190ml). Pour into the bowl and stir well.Step 3 Microwave on full power for 2 minutes (800w oven). Stir, leave to stand for 1 minute and enjoy. Can also be cooked on the Hob in 2 minutes. Cooking times may vary according to the power of your microwave.As with any hot product, please be careful.